With a dramatic round of midweek action safely tucked away into the history books, things move swiftly on this weekend with a full programme of Premier League fixtures. Manchester City headline the weekend action when they take on Arsenal at the Etihad Stadium on Sunday, while league leaders Liverpool travel to West Ham for a Monday night clash under the London Stadium lights. While the Premier League title race is hotting up nicely, it's also getting to the business end in the world of fantasy football. A double gameweek awaits both City and Everton - so with those factors in mind, here's your guide to who's hot and who's not. Artur Boruc: There has been much delight in fantasy land recently after Bournemouth's Polish goalkeeper was recalled to the starting line-up. The reason? He's one of the cheapest goalkeepers on the game and he's now getting minutes on the pitch to boot. £3.9m is unbelievable value, and a clean sheet against Chelsea shows Boruc could be worth long-term investment. Neil Etheridge: Results continue to be iffy for Cardiff in their battle against relegation, but support for Etheridge in the land of fantasy continues to soar. That's likely because he makes so many saves each game - couple those with the odd clean sheet and penalty save, and you're suddenly onto a winner. Keep the faith and keep him in your fantasy thoughts. Kepa Arrizabalaga: It's been a pretty grim week if you're a Chelsea fan. Yes, they've made tracks in the transfer market but on the pitch, things sunk to an all-time low at Bournemouth. Four goals conceded, confidence through the floor and another public slating from manager Maurizio Sarri means that it's time for Kepa to sit a couple of weeks out - particularly with Manchester City away coming up next week. Victor Lindelof: Life hasn't been easy for Lindelof since his arrival at ​Manchester United for a hefty €35m fee. Slowly but surely though, he's establishing himself at Old Trafford as their lead centre-back, churning out consistent performance after consistent performance. United are performing better too, and that reflects in the amount of support the Swede is receiving from fantasy bosses. He's great value too, costing just £4.9m. Jan Bednarek: Southampton are starting to find their feet after the arrival of Ralph Hasenhüttl as manager, and one of the first changes he made was restoring Bednarek to the team. In doing so, he's provided fantasy players with another cheap defensive option who is getting regular first-team action. The Saints won't deliver a clean sheet each and every week, but they are not the pushovers they were earlier in the season. ​Kieran Trippier: Things just aren't going right for one of the stars of England's World Cup campaign last summer. Trippier looks tired and his performances this season have fallen well below the standards that he set for himself last season. Spurs are leaking goals too - making him a less than attractive proposition for your side right now. Joao Moutinho: Wolves are well and truly back in the groove after some indifferent Premier League form, and Moutinho has played a starring role during that time. The experienced Portuguese midfielder is a wily campaigner, whose distribution with the ball has always been of the highest quality. He's started adding assists to his game of late, making his £5.2m valuation in fantasy world all the more appealing. Gylfi Sigurdsson: Everton can probably be best described as Marmite right now - because from a fantasy perspective, you either love them or you hate them. Good performances are often followed by bad, though one of the more consistent performers in the Toffees side is Sigurdsson. He's Marco Silva's main creative outlet and as a result, over 50,000 players have responded this week by drafting in the Icelandic international - could be time to follow suit with two fixtures coming up. Felipe Anderson: West Ham's good form in December is nothing more than a distant memory now, with things going from bad to worse in recent weeks. An FA Cup humbling at AFC Wimbledon was followed up with a crushing defeat at Wolves in the week - despite Anderson's best efforts. He can't do it alone, and without Marko Arnautovic firing on all cylinders, you begin to think that his influence on games will continue to diminish. Consider your options. ​Sergio Aguero: Manchester City may have slipped up in the week against Newcastle, but one positive did come out of the game - for fantasy bosses at least. Aguero returned, Aguero scored and all was back to normal for the millions of players who have him in their side. Over 100,000 players have rushed out to buy the Argentine since - given that he now has 154 Premier League goals to his name. He has two games ahead of him also, so that's a bonus. 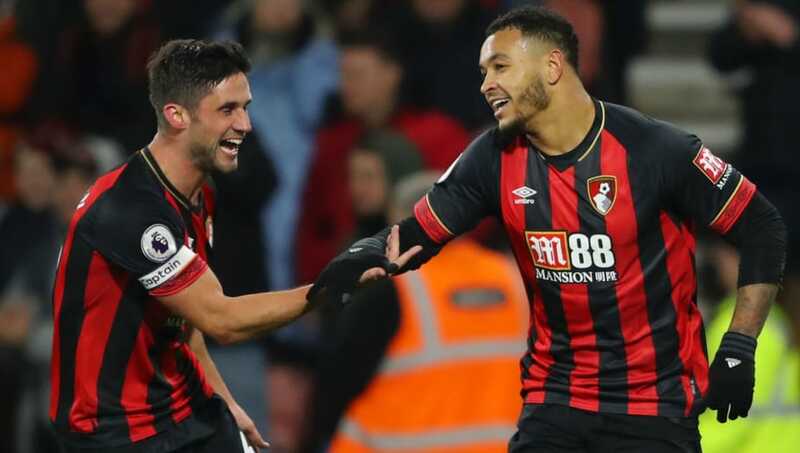 Josh King: You would have been forgiven for thinking that Bournemouth's slide down the table might continue with Callum Wilson ruled out with a knee injury. That might still happen, but on last week's evidence, it's unlikely - as King looks more than up for the challenge of leading the Cherries line in his absence. Two goals in the week against Chelsea have seen the £6.4m-rated striker's popularity soar, and you'd be a brave fantasy player to not consider snapping him up. ​Jamie Vardy: Things are actually going quite well at Leicester, even though the majority of the club's fanbase would probably tell you otherwise. One issue for the Foxes though has been the lack of consistency in Vardy's form. His price is starting to drop on the game, and there are many cheaper alternatives out there. It could be time to abandon ship and leave the Vardy party.